Hoysala Village Resort, Hassan, managed by the R.S Hospitality Services, is one of the favorite first class hotels in Hassan that is a wonderful blend easy accessibility and tranquil location. The hotel is situated far away from the din of the city and is the ideal retreat for those who wish to take full advantage of the salubrious climate of the place. Staying put at Hoysala Village Resort in Hassan is a rejuvenating experience for any jaded traveler. Hoysala Village Resort in Hassan features a total of 33 rooms and suites. 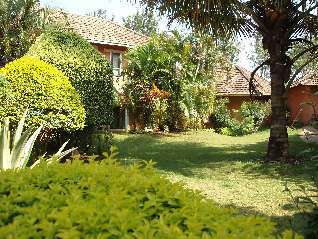 The guests can take their pick from the cottage type accommodation, standard room and suite room. The resort is a wonderful synthesis of local Hoysala architecture and the idyllic simplicity of the Malnad Villages. The rooms are commodious and are facilitated with all the requisite modern in-room amenities that ensure all the comfort to the guests. Some of the amenities that require special mention include attached bath with running hot and cold water, designer tiled floors and eco-friendly accessories. Hassan's Hoysala Village Resort boasts of a multi-cuisine restaurant that offers an assortment of mouth-watering dishfuls whipped up by world class chefs. The guests can sample enticing Indian, Chinese and Continental dishes. "Karanji" is the bar that is well-stocked with an alluring array of choicest drinks. From chilled beer to refreshing cocktails, you name it and they will be only to happy to oblige you at the bar. Hassan's Hoysala Village Resort is impresses the business guests with up to date conference and banquet facilities. Be it a conference or any other formal or informal events, the business facilities are perfectly capable of sweeping you off your feet and you can be assured of the success of the event. The resort leaves no unturned to ensure that you spend some quality and unforgettable moments here. This explains the presence of a number of recreational amenities that include swimming pool, badminton courts, volleyball courts, ayurveda therapy center and village safaris. The other auxiliary facilities and services that are made available to the guests at Hoysala Village Resort in Hassan include travel assistance, car hire and round the clock impeccable room service.